When the Cavs acquired Kevin Love to go with LeBron James and Kyrie Irving in the summer of 2014, fans were justifiably optimistic about the future of the franchise. Love was one of the best power forwards in the league in Minnesota. Irving was one of the top point guards in the league. And LeBron was the best player on the planet. It’s only been a year and a half, but my how things have changed. Love went from a top-five power forward to not making the All-Star team in back-to-back years, with no regular season injuries to blame. Irving went from arguably a top-five point guard to playing inconsistently. And LeBron can still be the best player on the court on any given night, but a player in Oakland has been just a little better the past season and a half. I’d like to take a look at each player individually and analyze their production in their second season together with this group compared to last season. Before we get into that, there’s one issue worth addressing. If the Cavs really are a “Big Three,” then why do only two players have efficient scoring nights out of the three players each game? Some nights LeBron and Kyrie play great, but Love is the odd man out and shoots for a poor percentage. Some nights LeBron and Love come up big, but Kyrie is quiet and shoots for a poor percentage. There even was a game recently where Love and Irving played great, but LeBron had a horrible night shooting. Over the course of the last ten games when they all have been on the court, there have been eight occasions where at least one member of the “Big Three” scored fewer than 15 points. The Cavs are 6-4 in that stretch. LeBron had one game where he scored fewer than 15. Irving accounted for two of those games. Love accounted for five. Let’s stretch out the sample size though, going all the way back to the time Irving made his season-debut, on December 20th against Philadelphia. Taking into account the Cavs were easing Irving back into unlimited minutes, and it would take him some time to get back to 100 percent, here are some numbers regarding the production of the “Big Three” in the 30 games they all were on the court together. Of the 30 games, LeBron scored fewer than 15 points on three occasions. Pretty dang consistent. Irving in those 30 games, scored fewer than 15 points in 12 games. Love, who people are quick to point out is averaging 16 points per game, has scored fewer than 15 points in 15 of the 30 games. In those 30 games, there have only been seven times where each member of the trio scored at least 15 points. Excuse me for expecting a “big three” to consist of three guys putting up 15 points or more, night in and night out. Maybe my expectations are too high. 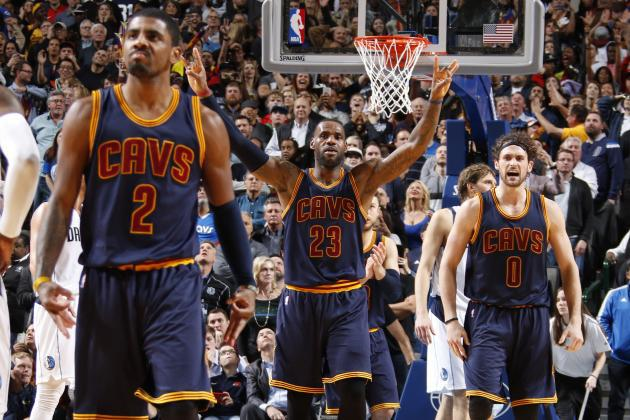 The Cavs’ record in that 30-game stretch is 22-8. That’s all that matters right? 22-8 is really good. That’s a win percentage of .733. Fantastic. Two of the losses came to Golden State, and the Cavs fell to San Antonio, Toronto, Boston, Chicago, Charlotte, and Detroit each once in that timeframe. All of those teams are at least .500 and the Pistons are the only team that would not make the playoffs if the season ended today. But let’s take a look at each member of the “Big Three” individually, how they have fared compared to last season, and how they play when they’re all on the court together. We start with LeBron. The model for consistency. He’s the team leader. He’s been the leading scorer and leads the team in assists. Hard to criticize a guy who is in the MVP conversation every year. We would like to see the free throw percentage (72 %) and the three-point percentage (28 %) a bit higher, but overall can’t complain. Next, we move to Irving. To be fair, he spent the first several weeks trying to get back from his knee-injury. Maybe he still isn’t even back to 100 percent. But just looking at his numbers in 2015-2016 compared to his previous four seasons in the league, it’s not pretty. Irving is averaging a career-low 4.4 assists per game. Last season, he averaged 5.2 assists, which was the lowest of his career prior to this season. This season Irving is averaging 18.9 points per game. He averaged at least 20 in three straight seasons after his rookie season, in which he averaged 18.5 points per game. But a point or two here or there is not a big deal. Especially when you factor in he has to share the scoring with Love, LeBron, and J.R. Smith, who we’ll mention later on. Perhaps the most troubling aspect of Irving’s season up to this point is that he’s shooting just 30 percent from three-point range. It was not long ago (2013) when Kyrie was winning the three-point contest. And although the three-point shootout is meaningless, Irving’s numbers in his four seasons prior to 2015-2016 are significantly better. Irving shot 40 percent as a rookie, 39 percent in 2012-2013, 36 percent the next season, and 42 percent last season. One would think that the additions of Love, Smith, and LeBron would only help make it easier for a knockdown shooter like Kyrie. That seemed to be the case in 2014-2015. But for whatever reason, maybe the injury is all there is to it, Kyrie is having his worst shooting season of his career from beyond the arc right now. Now, we move on to Love. It may be harsh and some view it as unfair to critique a third-option like Love so much, but the criticism is not unfounded. Of the 30 games in which the “Big Three” have been on the court at the same time, Love has scored less than 15 points in half of the games. His overall average in the 30 games that Irving and James have been on the court with him is 15 points per game. The inconsistency is troubling, however. In many cases, Smith has become a more reliable source of scoring than Love, since Irving’s return from injury. In those same 30 games, Smith has scored 15 or less 17 times. Smith is averaging 13 points per game. Smith and Love are neck and neck in scoring. Some nights, Smith is really the third-option. As for the comparisons between Love’s role on the Cavaliers and the role Chris Bosh played in Miami, let’s look at Bosh’s numbers in Miami over four seasons. Bosh averaged 19, 18, 17, and 16 points per game consecutively from 2010-2014 when he played with LeBron. His shooting percentage was never below 49 percent, and he shot above 50 percent in three of the four seasons. Love is shooting 42 percent this season. That can be attributed to the number of three-pointers he attempts compared to what Bosh was shooting in Miami, but it’s at least fair to say Bosh was more efficient with his touches. Love is a better rebounder than Bosh, but Bosh was and still is a better defender. So the comparisons between Bosh and Love are somewhat disrespectful to Bosh, because although at the time he may not have been praised as much, he fit in with Wade and LeBron better than Love does now with LeBron and Kyrie. The last point I’ll make about Love, as it already seems like I’m singling him out, is that his numbers have regressed in over a season and a half. He averaged more points per game in 2014-2015 and shot for a slightly better percentage. But that is not only applicable to Love. Kyrie’s scoring, assists, and field goal percentage are all down from last season. How much time is enough to expect the chemistry to be improving instead of regressing? We’re at the point of the season where teams are supposed to be clicking. The Cavs have gone 16-9 over their last 25 games, while the Toronto Raptors have gone 20-5 in their last 25. That may not seem like a big deal, but the Cavs just blew a nine-point lead with less than five minutes to play in the fourth quarter in Toronto. They are now two games ahead of the Raptors in the standings. Toronto is the hottest team in the Eastern Conference and owns the tiebreaker after winning two of the three regular season matchups vs Cleveland. So if Toronto wins two more games than Cleveland the rest of the way, with 25 games remaining, the Raptors would get home court advantage in a potential Eastern Conference Finals. Let’s also take into account that Kyle Lowry has owned the Cavs this season. He just scored a career-high 43 points, carrying his team, while DeMar DeRozan suffered flu-like symptoms and shot 1-for-11, scoring just six points; his worst game of the last two seasons. The Raptors could not have gift-wrapped a game any more perfectly for Cleveland to win and Toronto still came out on top. Is it possible that the dynamic duo of Lowry and DeRozan (plus their solid role-players) could take down the “Big Three,” that doesn’t get consistent production from those three players night in and night out? You can count on DeRozan and Lowry to each score about 20 every night, unless DeRozan plays through a flu. We can’t count on LeBron, Kyrie and Love to all show up with their “A” games on the same night. That’s what it’s going to take for this team to get through the Eastern Conference, let alone win a title. There’s 25 regular season games left. One would figure the Cavs will have about ten or so games in the playoffs before an Eastern Conference Finals matchup, likely with Toronto.. Will the Big Three be clicking by then? Is anyone else wondering why last season when we said “wait til these guys have more time together to gel,” we still haven’t seen the type of chemistry one would hope for from a team with three stars? The talent level is there. But it’s been shown year after year that talent alone doesn’t win a championship. Toronto may not have the talent level of Cleveland, but the chemistry is undoubtedly better at this point of the season. Some would say that Atlanta was the same way in 2014-2015, but the Cavs swept the Hawks in the Eastern Conference Finals. That’s true. But Atlanta didn’t have two players who can take over a game like DeRozan and Lowry. If people are planning for tickets to the NBA Finals in June, they may want to make sure the Cavs get through Toronto first. It sounds absurd to fans who come into the season with pre-conceived notions that the Eastern Conference is a joke and no team will even give the Cavs a run for their money, but it’s impossible to ignore the type of run Toronto is on right now. They may not get the TNT and ESPN games every week, but they are playing as well as any team in the league over the last two months. Another aspect to consider when looking at the Cavs and Raptors is the “X-Factors.” Guys like Iman Shumpert, Tristan Thompson, Timofey Mozgov, J.R. Smith, and Matthew Dellavedova for the Cavs. Or Terrence Ross, Jonas Valanciunas, Bismack Biyombo, and Corey Joseph for the Raptors. If J.R. gets hot, or Tristan puts up a double-double, obviously that’s going to go a long way in deciding the outcome. If the Cavs let Ross and Valanciunas tear them apart like they did on Friday night, that’s going to play a major role, as well. Both of these teams are deeper than many people realize. Clevelanders can take pride in a 41-16 record. They can take pride in beating Oklahoma City twice, San Antonio once, and Toronto once. But against the top five teams in the league, the Cavs are 4-5. Golden State, San Antonio, Oklahoma City, and Toronto are four of the top five teams, along with Cleveland. Maybe you don’t put stock in the regular season. That’s fine. The nine losses to teams near the bottom half of their conference are meaningless. It wouldn’t matter if they lost 20 to teams below .500 because it’s a new season once the playoffs start. Sure. Before this Toronto game, I was comparing the Cavs to Golden State to measure championship standards. But Friday night’s loss north of the border has now lowered the standard just to “staying in first place” in the East. If that’s what we’re getting to, where Toronto is a serious concern, what does that tell you about the Cavs’ chances to beat Golden State in the Finals? The last point I will make about this Eastern Conference playoff picture is that some of the criticism of the Raptors has been their lack of success in the playoffs in recent years. Our memories are short when we want them to be, but think back to the Golden State Warriors prior to the 2014-2015 season. The Warriors had a great young core of up and coming players. They were a team on the rise that couldn’t seem to put it together in the post-season. Then, in 2014-2015, they started all clicking. Steph Curry and Klay Thompson were phenomenal. Draymond Green began to emerge as one of the better players at his position. Of course this year, they have evolved to another level. Let’s look at where the Raptors are now compared to where Golden State was a few years ago. The Warriors were the sixth-seed in 2012-2013 and lost in the Western Conference Semi-Finals. In 2013-2014, they were the sixth-seed again and lost in the first round. The Raptors are fresh off of back-to-back playoff appearances, losing in the first round both times. Lowry is 29 now. DeRozan is 26. Both are averaging career-highs in scoring. Curry and Thompson both had the best season of their careers up to that point in 2014-2015. Curry won MVP. Thompson averaged a career-high in scoring. 2014-2015 was the season Golden State made the jump from a team that choked in the playoffs to becoming world champions. The trajectory of Toronto is at a similar pace. It took the Warriors two early exits from the post-season before they could find ways to win and eventually get a title. This is not to say that Toronto would win a title this year, but to simply discount them because they were eliminated from the playoffs early the past two seasons, and not acknowledge the tremendous improvement among their two best players and their team as a whole is to discount the whole picture. In the mean time, we have a little more than two months before the two teams would face each other in the playoffs. Let’s see if the Cavs get to where they need to be, with all three stars playing at a high level, and if Toronto cools off.